Taylor Davis, 20, a college student waiting tables in Wellesley for the summer, waits days to listen to her voice mail messages and, even then, checks her inbox only when she’s bored. The problem is, these days, not many people like to listen to them. In an age of ever-speedier communications, a growing number of people are unwilling to endure voice mail’s shortcomings. Some can’t stand the endless prompts just to hear a longwinded - and often pointless - message. (Hi, it’s me. Why aren’t you picking up? I’ll call you later.) Others dislike voice mails that can’t be searched, easily forwarded, or surreptitiously played during a meeting or lecture. And on the off chance a message does contain key information, it’s often left at the end of a ramble and spoken rapidly, forcing the recipient to listen all over again. And then write it down, of course. In other words, after the beep, please don’t leave a message. Or do so at risk of being ignored. More than 30 percent of voice mail messages remain unheard for three days or longer, according to uReach Technologies, which designs voice messaging systems for Verizon and other phone companies. And more than 20 percent of people with messages in their mailboxes rarely check them, said Saul Einbinder, the firm’s senior vice president for marketing and business development. A survey done for Sprint by Opinion Research Corporation found that with the exception of people age 65 and over, adults respond more quickly to a text message than to a voice message. Those under the age of 30 are four times more likely to respond within minutes to a text message than to a voice mail. Adults 30 and older are twice as likely to respond within minutes to a text message than to a voice message, according to the survey. With impatience about voice mail growing, services are springing up to take the voice out of voice mail. 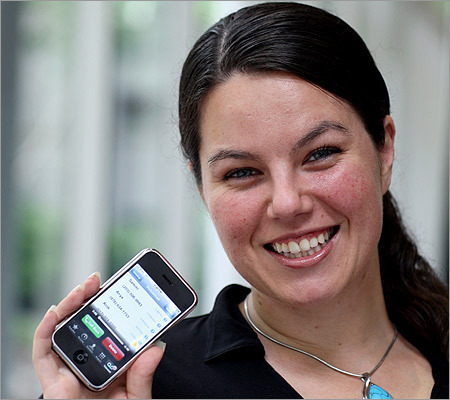 So-called visual voice mail comes standard on the iPhone and is also available on other smartphones. It allows users to see a list of calls (with photos of callers, if available) and to listen to those calls in any order. Some visual voice mail systems allow users to e-mail voice messages to others or post them to a blog. Perhaps best of all, users can access messages simply by clicking on them or tapping a screen, eliminating repetitive and time-consuming instructions and prompts. For those who can’t be bothered to listen to messages at all, even those they care about, a number of companies now offer voice-to-text transcription. The best known is Google, which at the end of June began a rollout of Google Voice, a service that offers - among other things - voice mail transcriptions free of charge. James Siminoff, founder and CEO of PhoneTag, another company that transcribes voice mails and sends the text to users, agrees. “Voice mail is a dead service as it stands today,’’ Siminoff said. His company estimates that it takes 6 seconds to read a voice mail that would take 79 seconds to hear. Fees for PhoneTag’s services range from 35 cents to transcribe a single message to $29.95 for unlimited monthly transcriptions. Initially, Siminoff said, some people are hesitant to lose the “sweet nothing’’ of loved ones’ voices: “We’ve had people who said ‘I’d never use [a transcription service] - I want to hear how my wife sounds on every message.’ ’’ But people don’t check them quickly. Siminoff said the average person checks the voice mail six to eight hours after it was left. And after all, we do ask people to leave a message - even if we have no intention of checking it. See what Sprint, AT&T, others offer for phones and prices.